Happy Summer 2017 to all So Cal Flame Surfers! Jim from CBS also gave us a great demo on the Glow Powder product that has been developed by CBS. This powder can be incorporated into fused and flameworked glass to impart a luminescent/fluorescent effect. Several of our members took advantage of the special discount on the Glow Powder offered by CBS so I hope to see some Show and Tell pieces using the powder at upcoming meetings. Thanks to everyone that brought in bead donations for Beads of Courage. Over a hundred beads were donated at the meeting and we have collected over 500 beads so far for BOC. And thanks to all that responded so creatively to the ideas for making floral beads in the last tutorial. Here are some of the beautiful beads donated by Susan Haskell, who won our prize for best response to the tutorial theme. The final news from the meeting is that we decided to formally participate in the BOC 2017 Bead Challenge as a Host Studio. In September, BOC encourages glass studios from around the country to sponsor an Open Studio event, which is an opportunity for glass artists to meet and connect with members of the public and medical community that benefit from our donations. This event will be held on September 9 at a new location, GooseFire Glass Center in Westminster. See below for more details about the event and how you can help make it a success. 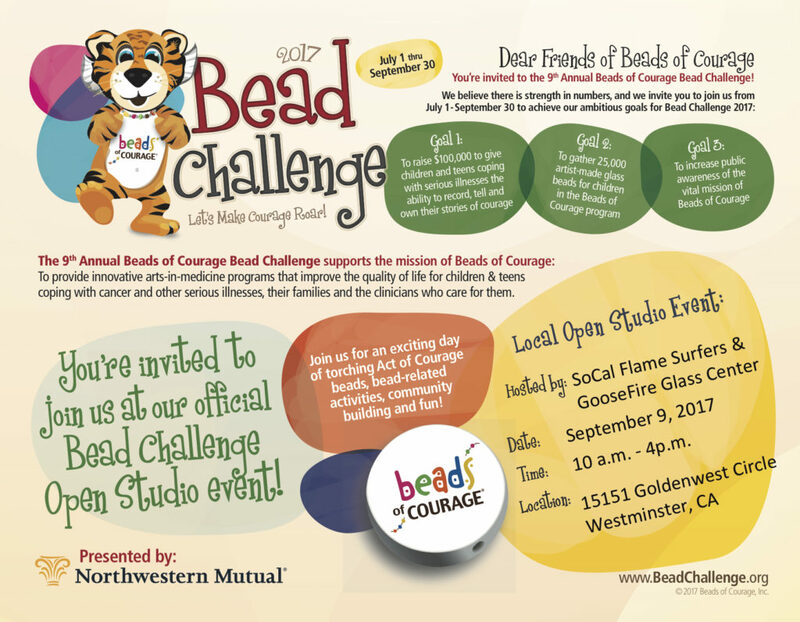 SCFS is holding an Open Studio Event for Beads of Courage on September 9. This event is part of the 2017 Bead Challenge, where BOC hopes to raise funds and increase bead donations for use in their programs. We have held this event several times in the past and it has always been a very rewarding and inspirational event. This year, we have added a new feature sure to please all: air conditioning! The GooseFire Glass Center has graciously offered to partner with us to host this event at their location in Westminster. GooseFire Glass Center is a combination gallery, store, and studio that provides studio space to some of the regions premier glass artists, with a focus on functional art (see photos below). This all-day event will have a variety of activities intended to educate and engage the public and we are looking forward to your help to make it a success. Torch Demos. We will be making beads for BOC all day long in the GooseFire Studio. Some artists will be doing demos to explain bead making techniques, while others can just make beads for donations. Choice Raffle. We will be having a special raffle of glass art and jewelry at the event, open to all. We are currently obtaining donations from professional artists in California and elsewhere. You will be able direct your raffle tickets to the specific items you hope to win. Don’t miss this special opportunity to win some a pieces of art from one of your favorite artists. Sponsor a Bead. Visitors are encouraged to become a Bead Sponsor for a child in the Beads of Courage Program. Each of the beads that are sponsored will be used as an Act of Courage bead for a milestone in a child’s treatment journey. Participants can pick a bead that inspires them and package it with a note of encouragement. Carry a Bead. We will selling carry a bead kits that attendees take home to complete and return to BOC. Each kit contains a pair of matched beads, clip, and instructions. The beads participate in a journey or special event with the sponsor and then one of the beads is returned to BOC along with a note of support and inspiration. We need SCFS member to make the bead pairs for this activity. Courage Clip. A backpack clip with a fun assortment of beads that the attendee chooses! Attendees can make one clip per person – Donations will be strongly encouraged, but not mandatory. Polymer Clay Table. A demonstration and opportunity for hands-on creativity! This station will allow attendees to make handmade polymer beads that they can take home or donate to Beads of Courage. Refreshments. Drinks and snack will be provided at nominal cost for attendees to encourage them to watch the demos and participate in the activities. Lunch will be provided for all SCFS club members that help with the event. Regular SCFS Club Activities. While the focus of this day will be the BOC activities, we will still be having some of our regular club activities in the morning: Gift Exchange, Show and Tell, Bead Donations. We are hoping for a good turnout of members to participate in the event, so this should be a great opportunity to meet up with friends and get to know some of our newer club members. The Open Studio Event will be a lot of fun, but we need some of you to help us organize the event and supervise the activities. Several of you volunteered to help at our June 10 meeting, but we can use more help. Please consider helping out with one of the following activities during the day (either morning or afternoon). Torch demos. Need folks to work on the torch to make beads and explain to others what you are doing. Supervise an activity table. 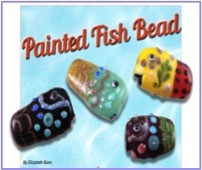 We need people to help run the Sponsor a Bead, Carry a Bead, Courage Clip, and Polymer Clay Bead Activities. Most of the effort is to just help the participants select beads and answer questions about what to do for the activity. 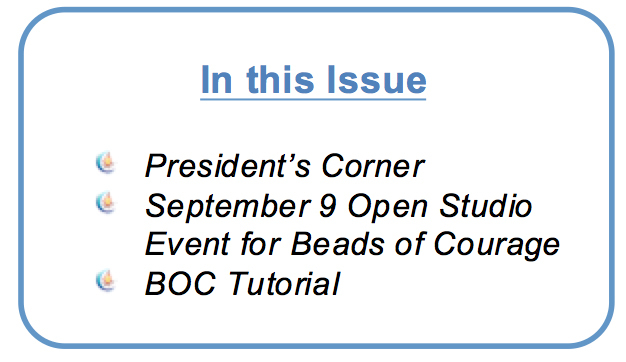 Bring in beads for BOC. We will use these beads for the Sponsor a Bead activity and also our regular donations. Make paired beads for Carry a Bead. Help with set up and refreshments. Especially in the morning. If you can help with any of the above activities, please contact Wendy Leys at Firesinger1@gmail.com or myself at steveb@sccwrp.org and let us know what type of participation/help you want to provide. We will send you more information. Even if you cannot commit to a defined role for the event, we hope you will come to participate, see the GooseFire Glass Center, meet new friends, and connect with the folks that our bead donations help. Here is your Summer BOC tutorial to help stimulate your creative juices. These cute fish beads are easy to make, kid friendly, and provide lots of possibilities to personalize with color and design. Click on the image to download the tutorial. We will offer a special prize to the bead donation at the September meeting that best responds to the fish theme.